What is another word for inadequate? in-ad'e-kw[= a]t, adj. insufficient.-- ns. 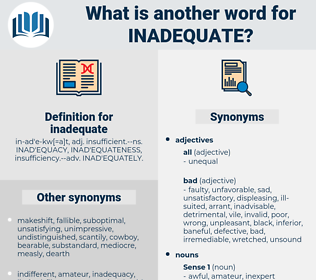 INAD'EQUACY, INAD'EQUATENESS, insufficiency.-- adv. INAD'EQUATELY. inaccurate, inconvenient, ill-equipped, little, incompetent, ill-adapted, incongruous, misguided, sub-standard, irrelevant, poor-quality, underdeveloped, disappointing, proper, precarious, underemployed, insignificant, incapable, unacceptable, unfavorable, proportionate, unachieved, unfortunate, disabled, impaired, inconsistent, kefaya, erroneous, unable, undersized, dysfunctional, unsafe. sufficient, disproportionate, flawed, inefficient, substandard, ill-suited, defective, ineffective, appropriate, unfit, incorrect, unsuited, imperfect, insubstantial, wrong, scanty, scarce, faulty, suitable, unsuitable, satisfactory, unreasonable, unsound, inept, deficient, scant, inopportune, ineffectual, inexpedient, excessive, outdated, undue, feeble, unseemly, unsatisfactory, undesirable, Underemployment, poor, ample, unfair, untimely. deficient, inadequacy, unsatisfactory, poor, lack. unsuitable, deficient, inadequacy, unsatisfactory, Underemployment, poor, lack. potent, perfect, capable, able, enough, strong, full, sufficient, complete, competent, finished, abundant. hefty, super, king-size, rich, jumbo, largish, big, sizable, enlarged, substantial, expanded, large, considerable, up to, oversize. The noise was neither a great nor terrifying one and I distinctly remember thinking it quite inadequate to the occasion.